A python script for sending pushsafer.com notifications in ZABBIX. Send Zabbix notification to Pushsafer enabled devices. Subject           Subject you want to push to the device(s). Message           Message you want to push to the device(s). You first need to register for an account at Pushsafer and download/install the clients for your devices (Android/iOS/Windows 10). You will then able to retrieve your PrivateKey or AliasKey that you will need to provide in your zabbix user media configuration. Copy the zabbix-pushsafer.py script to your Zabbix alert scripts directory. Usually this is /usr/lib/zabbix/alertscripts but configuration can differs depending on how you installed Zabbix. In doubt, check your zabbix_server.conf. 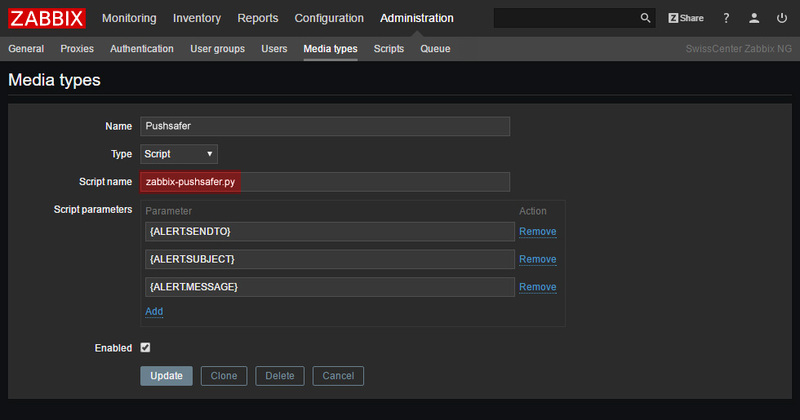 Go to your Zabbix Administration / Media types screen and add a new media. Specify the name of the script in script name and check that the parameters are correct. You will need then to add the media to your users. For this just edit an user and add a media selecting the one you just created before. Specify the Private or Alias Key in the Send to field.